You may want to travel to Ireland by ferry if you are coming from or going to the United Kingdom or France. You may want to bring your car, motorcycle or bicycle with you on the trip. 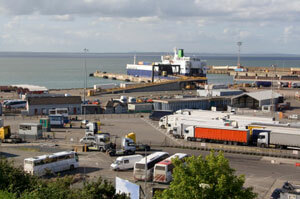 The ferry and boat services include travel from England, Scotland, Wales, the Isle of Man, and France to Ireland. If you live in one of the nearby countries or are touring on vacation, you may choose a ferry system rather than the airlines. You get a unique view of the country as you arrive across the Irish Sea. Ferries come into six main ferry ports; two in Northern Ireland and four in the Republic of Ireland. The passage from England to Ireland takes from two to four hours depending on the type of ferry and the port. Holyhead (Wales) to Dun Laoghaire. The passage from France to Ireland is an overnight cruise usually arriving by noon the following day. You may also consider taking a trip by ferry from Ireland to one of the destinations listed. You can make a trip across for a day or longer to add an interesting dimension to your Irish vacation. You should check trip details with the ferry companies if you decide to travel to Ireland by ferry. Irish Ferries, Stena Line, Celtic Link Ferries, Swansea, Brittany Ferries, Norfolkline Irish Sea Ferry Services, and P&O Irish Sea are all ferry lines serving Ireland. You may be able to get a discount by reserving your ticket online.